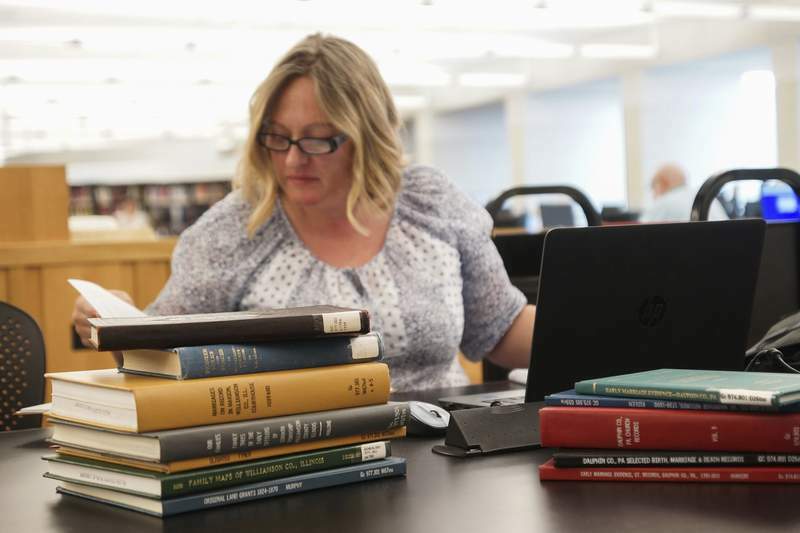 Mike Moore | The Journal Gazette Sunny Morton, an author and speaker on genealogy, takes time Thursday to do some research at the Allen County Public Library's Genealogy Center downtown. The exhibition hall at the Federation of Genealogical Societies' 2018 conference is a treasure trove of material for genealogists and history buffs alike. Dozens of tables lined the Grand Wayne Center convention hall Thursday afternoon for more than 700 attendees offering books on genealogy, maps, jewelry and other items. Presentation areas for sites such as Ancestry, Celebrate DNA, Genealogy Gems and Family Search spread throughout the crowd like so many branches on a family tree. On Thursday morning, local TV personalities compared DNA results and research from the Allen County Public Library's Genealogy Center, and elsewhere in the convention center, experts led member workshops on various topics, including how to use Google to trace an ancestor, German historical geography and Indiana genealogy. Stallings said the organization likes to hold its conference in areas where there is interest in genealogy. The exhibit hall is open to the public and runs from 9 a.m. to 5 p.m. today and 9 a.m. to 3 p.m. Saturday.